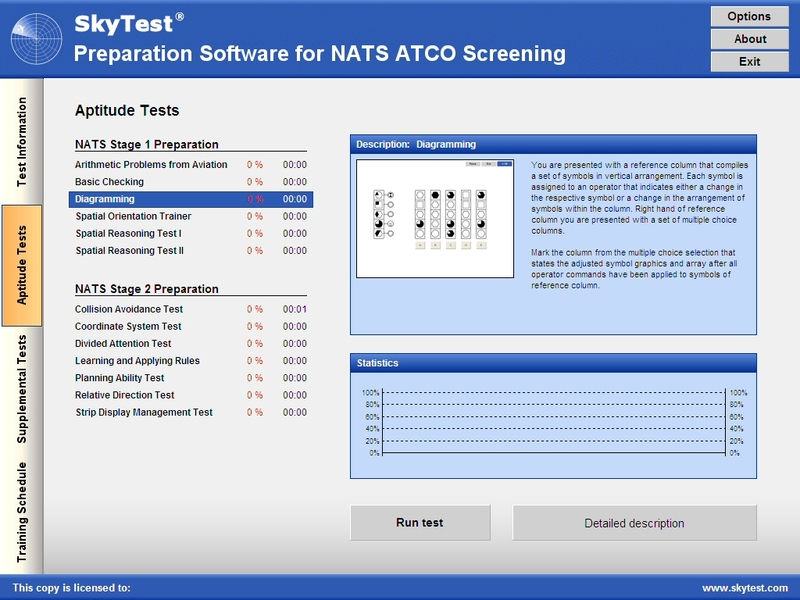 SkyTest® Preparation Software for NATS ATCO Screening compiles 13 training modules that address the tasks applicants will be presented with at the assessment center including tests of high complexity such as Diagramming and Strip Display Management Test (one of the prep modules for the new FEAST tests). 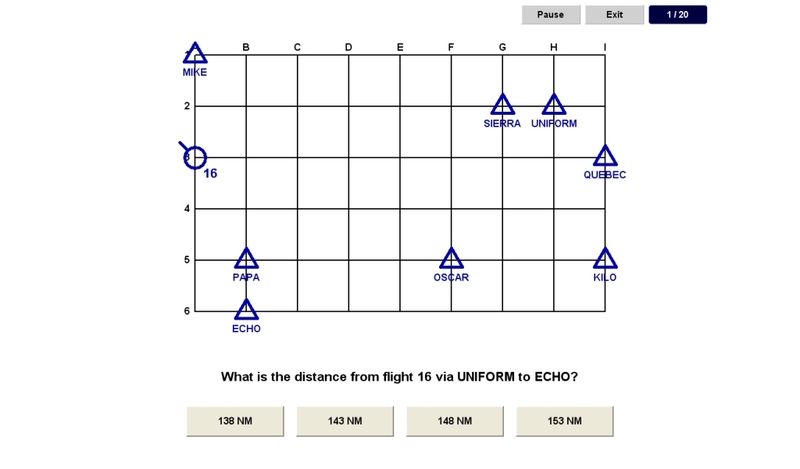 The NATS specific training modules of this software are supplemented by 5 additional operational aptitude and arithmetic tests meant to provide customer with broader options in training. 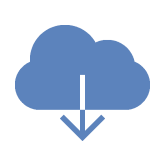 All SkyTest® software modules are developed under a didactic concept. Predefined training levels in many modules make the tasks easy to understand and convenient to approach. To increase task complexity in advanced stages of preparation most modules allow for training in a user defined setup. 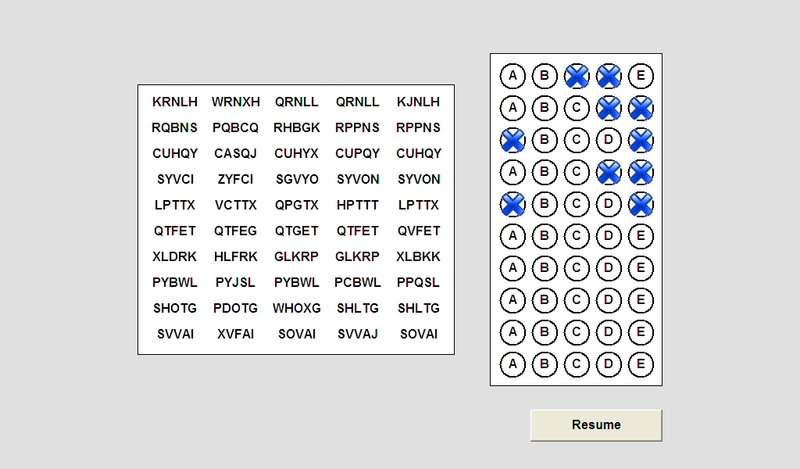 A list of all test modules included in this software is displayed in the frame right to this text with brief information on each test. This product contains a supplemental program which includes an additional training module, dubbed Multi Control Test (MCT), for FEAST Stage 2 preparation. 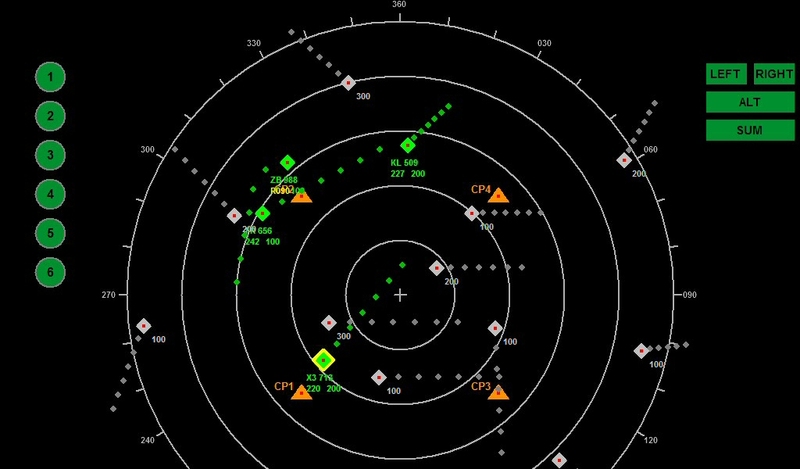 Multi Control Test puts you in the role of an air traffic controller and in charge of a control sector. 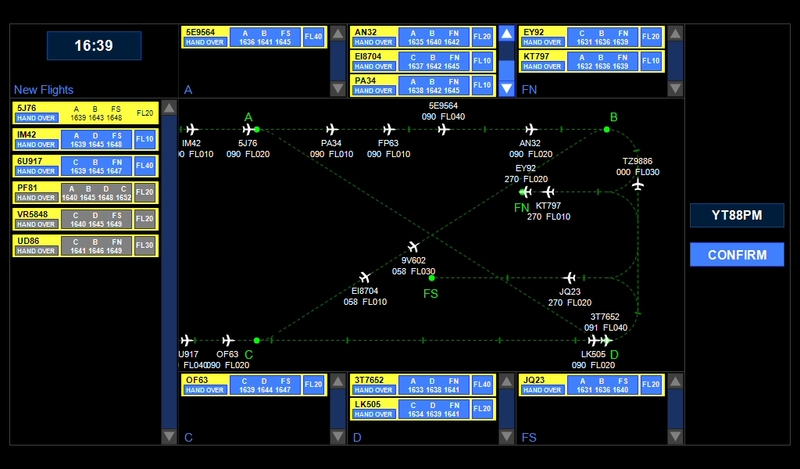 You navigate air traffic through a network of waypoints and resolve conflicts before they occur. A concurrent audio task claims aural attention. Furthermore, this new add-on features extended training modules for Math (Math Word Problems, Mental Arithmetic, Number Series and Numerical Estimation), Physics (Electricty, Magnetism, Mechanics, Optics, Thermodynamics and Waves) and Technical Comprehension. 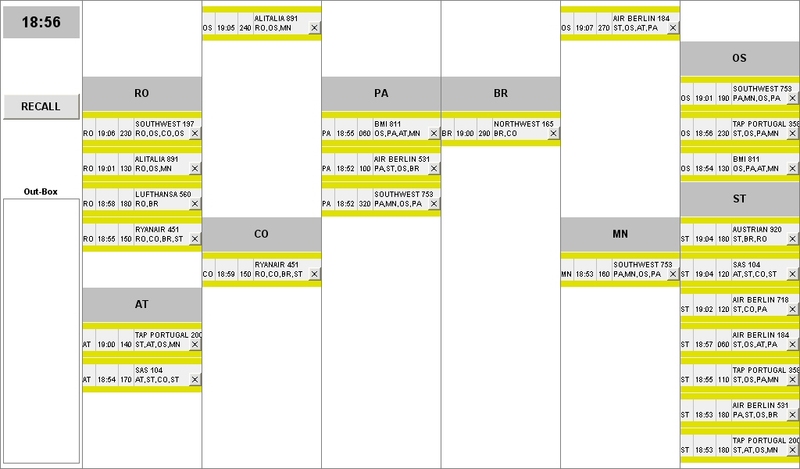 An integrated training schedule gives you the opportunity to prepare for your test extremely effectively. With the regular training, constantly monitored by the program your abilities will be promoted right up to examination level. This training plan allows you to define the tests that you would like to practice for your screening. It is possible to set up a defined weekly training schedule and specify when you will carry out the practice applications. The program will challenge you for training as often as necessary until you have reached your defined target result. As soon as you show a certain level of consistency and regularly achieve the desired result in the individual test, the program will less often include it in your training plan. If it turns out, however, that you have tended to get worse results in such a test, the program sees to it that this test will occur more frequently in your training plan. This will on the medium term ensure that your results return to a consistently high level. All the tasks are randomly generated, i.e. there are a very great number of tasks that you may be asked to undertake. So, for example, in dice unfolding the same display practically never appears twice. This has the advantage that no "familiarity breed contempt" effect sets in, as when the same tasks are repeatedly set. 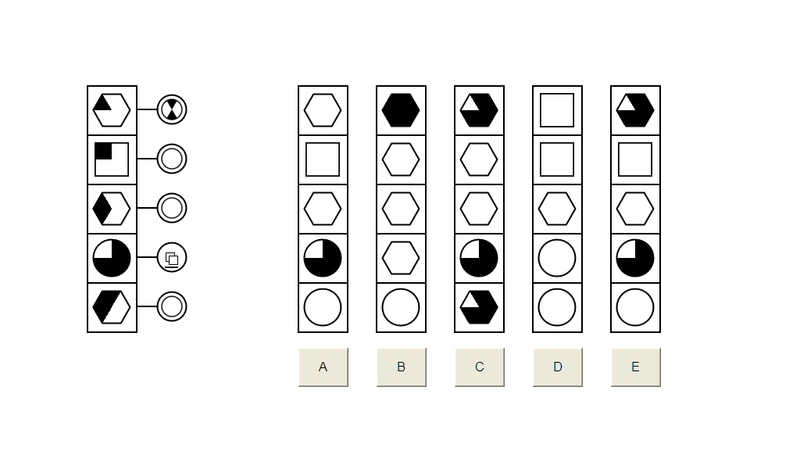 The same goes for all the other tests and for the mental arithmetic: Each task set is created by the random generator, so that the same tasks are very seldom repeated. All the same the results of the calculations task are always sensible, whole numbers. It is also worth mentioning the training module for gearing: each new instruction for the displayed cogwheels is also randomly generated. The program runs on any PC with at least 1 GHz processor and 512 MB Ram, a modern graphics card and Windows® XP®, Windows® Vista® or Windows® 7 / 8 / 10. It should also work on slower computers, but perhaps not quite so efficiently. Headphones are recommended for the sound. Input as a rule is via keyboard and mouse. For Stress Tolerance Test it is recommended to use pedals. For Divided Attention Test DirectX® is required (is contained by the cd and can be also downloaded here).